The charming hilltop town of Siena is considered the quintessential Tuscan treasure by travelers the world over. During this lovely daytrip you will enjoy a leisurely stroll through the town, marveling along the way at its most famous sites, including the stunning main square, Piazza del Campo, home of the Palio, with its spectacular Palazzo Pubblico. The magnificent Duomo, a true architectural marvel with both Romanesque and Gothic influences, is also not to be missed. Depending on the time of the year, you may also be able to view the precious, world-famous floor mosaics at the Cathedral. Next, you will proceed to San Gimignano, where you will stroll through the utterly enchanting town’s winding cobblestone streets, stopping along the way to take in the glorious medieval beauty at your own pace. No visit to Tuscany is complete without a San Gimignano tour! 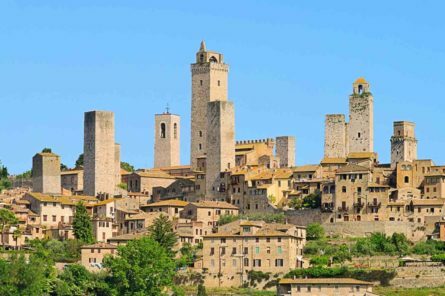 A perfectly preserved Medieval town with its walls and gates still intact, this hilltop “town of the 100 towers” offers a panoramic view of Chianti that overlooks Via Francigena, an ancient pilgrimage road between France and Rome. You may wish to visit the Collegiate Church of Santa Maria Assunta to see the 14th century frescoes of Old and New Testament stories and then to the Santa Fina Chapel which displays a fresco cycle from Florentine artist Ghirlandaio, a teacher of Michelangelo. The museum has a fascinating collection of Sienese art while the church of Sant’Agostino houses a Ghirlandio fresco cycle depicting the life of the church’s eponymous saint. Finish your visit atop the ancient walls to enjoy the view of the surrounding countryside. From San Gimignano, enjoy the ride back to your hotel while watching the unforgettable Tuscan landscape from the window of your Mercedes vehicle with the friendly English-speaking driver who will be your chauffeur for the day. During this Rome shore excursion from Civitavecchia, your English-speaking drive will provide an overview of Rome, including the Colosseum and Vatican. Escape the hustle and bustle of Rome and visit the scenic hilltop towns of the Castelli Romani on a half-day or full-day tour! Relax on the journey through the idyllic Alban Hills, and enjoy stops at Lake Albano, Castelgandolfo and Frascati. Learn about the ancient villages’ history and culture from your driver and sample a glass of Frascati wine while learning about Castelli Romani wine production. Day trip to the Castelli Romani from Rome, led by an expert local driver. Admire the scenery of the Alban Hills, where the pretty Castelli Romani towns are found. Visit Lake Albano and Castelgandolfo, the summer home of the pope. Sample a glass of Frascati wine in the town where it’s produced. Our full-day Rome tour explores the highlights of the city with a guide and driver, such as the Colosseum, Trevi Fountain, Pantheon and more. Take this incredible Rome day trip to the Amalfi Coast, and discover the UNESCO World Heritage Site of Pompeii—the ancient town that was blanketed beneath a sea of Mount Vesuvius’ volcanic ash for centuries. Then enjoy the dreamy coastal scenery that typifies this stunning area of southern Italy. Spend time at leisure in the picture-perfect town of Positano. A private Chianti tour including a wine tasting & full exploration of the Tuscan countryside, Greve & a panoramic drive along the via Chiantigiana. Enjoy this full-day Amalfi Coast boat tour on the private vessel of your choice. Stop in Positano and Amalfi and enjoy a swim in the blue waters. This private Rome shore excursion from Civitavecchia takes in the highlights of Rome, including the Spanish Steps, Trevi Fountain, and the Colosseum.